In the Middle Ages astronomy was one of the seven liberal arts along with grammar, rhetoric, dialectic, arithmetic, geometry, and music. In the Convivio Dante proclaims the nobility of astronomy as a science, praising its "high and noble subject, which regards the movement of heaven, and high and noble because of its certainty, as coming from a most perfect and regular principle" (Convivio, Bk. 1, chap. 13). The importance of astronomy for Dante is evidenced by the many astronomical references in the Divine Comedy. Dante's Heaven and Hell are Aristotelian in nature and form. Dante's notion of a corruptible and ever-changing earth surrounded by a series of immutable, nested crystalline spheres whose perfection increased with their distance Earth, was derived from the Greek philosophic tradition. While the Pythagoreans established the sphere as a perfect, if not divine shape, Aristotle synthesized earlier conceptions of the heavens into a cosmology congruent with his physical laws. Aristotle consigned everything that is corruptible and imperfect to the sub lunar realm, the region of the universe inhabited by the people and the animals of the Earth. Divinity and perfection were reserved for the celestial spheres - the Moon, Mercury, Venus, the Sun, Mars, Jupiter, Saturn, and the fixed stars - with the sphere of the moon being the lowest and least perfect. The celestial bodies that governed the spheres were made of an altogether different, ethereal substance; each heavenly sphere becomes more perfect as Dante travels closer to the highest heaven, the sphere known as the Empyrean where God resides. Dante's Hell also reflects he hierarchical structure of Aristotle's heavens. Just as the heavens become more perfect as one ascends through the crystalline spheres so do the circles of Hell become more evil the closer one approaches the center of the universe. At the center, to which everything heavy and Earth-like is drawn to, we find Satan appropriately positioned at the point farthest from the most perfect heavenly realm. 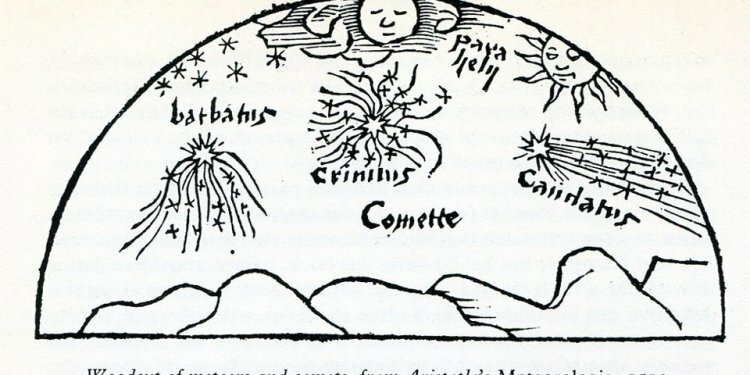 Dante's understanding of astronomy was largely derived from Albertus Magnus's commentary on Aristotle's De Cealo (On the Heavens), which was widely read during the Middle Ages. Medieval astronomers, like the ancient forebearers dating back to the first century of the common era, sought to explain their observations of the motions of the planets, the so-called 'wandering stars' in the hopes of predicting their relative positions for past and future generations. This aspect of astronomy demanded that true practitioners be talented geometers and mathematicians, as well as observers. One such practitioner, the Greek astronomer/philosopher Ptolemy (90-168) found that Aristotle's model of rotating, concentric crystalline spheres based on the premises of perfect and uniform (proceeding at a constant rate) circular motion did not predict the positions of the planets accurately. The notion of solid crystalline spheres, each rotating with a different, yet constant rate could not account for Ptolemy's observations of the motion of the planets in relation to the background sphere of fixed stars. Regular observations of the planets over the course of a year reveal that several of the planets not only change size and brightness, but also halt their regular West to East progression across the sky, moving East to West for a brief time in what is commonly referred to as 'retrograde' motion. In order to account for these observations and at the same time preserve the Aristotelian concept of circular uniform motion, Ptolemy introduced three geometric, mathematical constructs to the geocentric model of the universe: epicycle, eccentric, and the equant.